Saint Gabriel was born at Assisi in 1838. He was guided by Our Lady into the Passionist Order founded by Saint Paul of the Cross, and became a veritable Apostle of Her Sorrows. He was a very great and truly contemplative soul, whose only preoccupation was to unite himself to God at all times. He allowed no distractions to enter his spirit, and even though Italy, his country, was in a state of ferment when he entered religion, he wanted to know nothing of it. The way to attain union with our Saviour and our God was, for Saint Gabriel, as for Saint Louis de Montfort, his Heavenly Mother. He wrote home to his father, from the first month of his noviciate, Believe your son, whose heart is speaking by his lips; no, I would not exchange one single quarter of an hour spent near the Most Blessed Virgin Mary, our consolatrix, our protectress and our hope, for a year or several years spent in the diversions and spectacles of the earth. Among his resolutions was that of visiting Jesus in the Most Blessed Sacrament each day, and praying for the gift of a tender and efficacious devotion to His Most Holy Mother. He wrote a beautiful Credo, worthy to be printed in letters of gold, expressing all that he believed of the Mother of God. 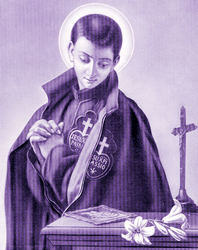 At twenty-four years of age Saint Gabriel died of tuberculosis, having already attained heroic sanctity by a life of self-denial and great devotion to our Lord's Passion and the Compassion of His Mother. Although his life was without any miraculous event, after his death in 1862 many miracles occurred at his tomb in Isola di Gran Sasso, Italy. He was canonized by Pope Benedict XV in 1920, and his feast was extended to the entire church by Pope Pius XI in 1932. He is the patron of youth, and especially of young religious. *On leap years, the feast day of this Saint is celebrated on February 28. Fear not, little flock, for it has pleased your Father to give you the kingdom.